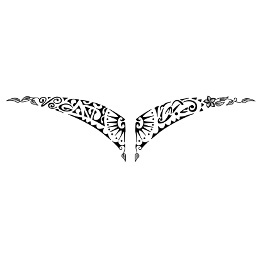 This design symbolizes harmony and veganism, as it was requested by Elizabeth, and it is enclosed by small branches with leaves which, on the left, become the V of the word Vegan. On the right a manaia, a creature with head of a bird, human body and tail of a fish, is a guardian angel and also represents harmony and union of the elements (the three fingered hand enforces this concept of union between sky, earth and sea). The sun in the middle symbolizes positivity and joy, and it includes tiki hands for protection. The flowers of frangipani symbolize beauty, harmony and shellter; shark teeth are for adaptability, protection and strength.